I’m hearing OL codes can’t be stacked with USAA or Fleet. It appears that many are struggling to find information on OL codes. So I’m here to make your life easier. 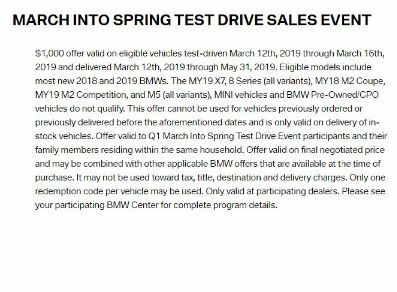 B. add “march” before the dealer name, and “.eventsbmw.com” at the end of the URL. If you get a 404 or redirect to homepage, then try another dealership until you get one that works. Here is a sample screen shot of the OL terms. It may vary by region. If you can’t find a dealer nearby that populates the page on their website, they may not be participating. However dealers may apply an equivalent discount when you mention the OL code. It’s up to dealer discretion and we aren’t sure how or when OL codes are being generated. Bmw ultimate driving events. New cities added. Get your $1000 OL code! It’s possible it no longer does. I’m not sure. If not, then west coasters are out of luck for the time being. Arguably the west coast, particularly SoCal, already has more than a $1k leg up on Bimmer deals based on number of dealers alone. I wouldn’t shed too many tears for us. As an aside, get yourself on as many BMW dealer mailing lists as possible if’n you wanna be tipped off to events that yield OL codes. I’ve pocketed three of them by virtue of being on Irvine BMW mailing list. Have yet to use one . . .
Not working for me on Long Beach, Crevier or Irvine bmw websites (from mobile device). Are the OL codes person-specific? Or can a code be given by someone who doesn’t plan to use it? If so, I’d love one if anyone has an extra! Is the OL code a taxed or untaxed incentive? Can’t find that info anywhere. Nah, I was wrong. It’s up to 32. You can’t just click the link…you should probably reread the information prior to the link. How is this valid after 3/16? I’ve found at least 2 east coast dealerships that have this page up, but all that’s there is either the same text as your screenshot, or a signup dialog, but no code. Over 60 times but it still doesn’t work!!! You’re not clicking hard enough! Maybe try another mouse?